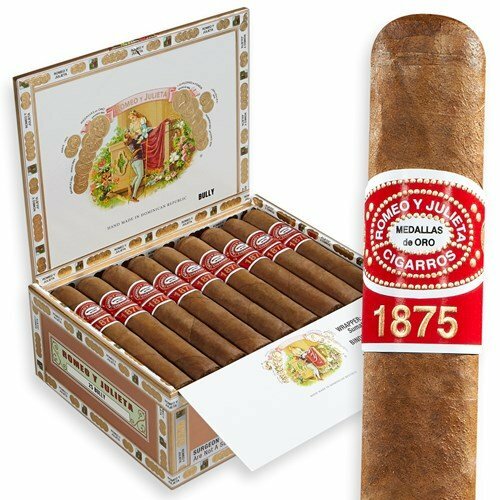 Romeo y Julieta 1875 cigars are one of the most recognized brands in the world. Founded in Cuba in 1875, the Romeo y Julieta 1875 is the first chapter of an iconic cigar brand. Today Romeo y Julieta 1875 cigars are handcrafted in the Dominican Republic by skilled artisans.The 1875 boasts a flavorful blend of oak and coffee for an overall mellow taste and medium body. The classic white ash burn is a result of a blend of Dominican long filler and binder tobaccos. Experience the Indonesian Shade Grown TBN wrapper and enjoy Romeo y Julieta 1875.